Dried mushrooms are an affordable and delicious ingredient to add to your meal. Find out how to rehydrate dried mushrooms for the best flavor and next to no bitterness. Dried mushrooms are such an underrated staple to keep in your pantry. They can add a quality “meaty” flavor to vegan and vegetarian dishes, they quickly bulk a meal that is light on vegetables, and they can be rehydrated to make a flavorful broth for cooking. No matter what you plan to do with your dried mushrooms, rehydrating them correctly is crucial for avoiding bitterness and grime. 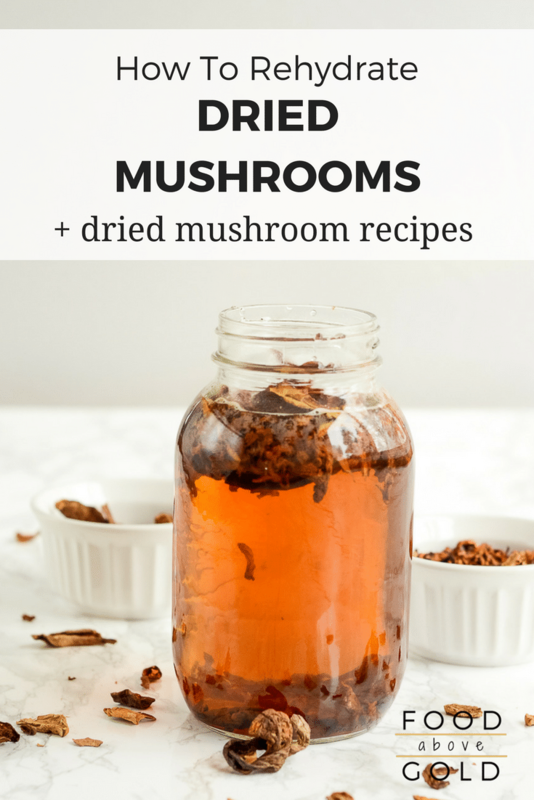 There are many different reasons for using dried mushrooms, but my favorite one is that it makes seasonal and rare mushrooms easy to keep year round. Not to mention, the price point on dried mushrooms is exceptionally reasonable. One ounce of dried mushrooms equals 10 ounces of fresh mushrooms. For the most part, they are almost as nutritious as fresh mushrooms as they’ve lost mostly water during dehydration. Plus, they add a lot of flavor to a dish that seems to just be missing something. During dehydration the flavor does become concentrated, so for many people, the flavor is stronger. What Kind Of Dried Mushrooms Should I Get? Everyone has their favorites. For me, I always keep dried porcinis, oyster mushrooms, and dried morels in my pantry. Dried black trumpets, wood ears, and dried shiitake mushrooms are also commonly used or found in dehydrated mushroom mixes. How Long Are Dried Mushrooms Good For? Ideally, just like with dried spices, flour, or any other pantry staple, dried mushrooms should be used within six months of purchase. Does that mean that they’ll spoil if you use them seven months after purchase? No. What it means is that the quality will, inevitably, diminish over time. The further you get from dehydration, the less potent the flavor will be. Also, in my experience, the tougher the mushrooms become when reconstituted. If the dried mushrooms aren’t kept cool and dry, they can get moldy. To create your own “best by” date for your dried mushrooms, write the date of purchase on the bottom of the container before storing it in the pantry. It will take quite a bit of time for the mushrooms to actually become inedible, but as a rule of thumb, they should meet the trash can if you’ve had them longer than a year. What’s The Best Way To Rehydrate Dried Mushrooms? One of the biggest frustrations for a finely tuned palate is that dried mushrooms are often bitter and tough when rehydrated. Most of the time this is caused by the method of rehydration rather than the quality of the mushrooms. The most common method to rehydrate dried mushrooms is to pour very hot (sometimes boiling, but usually just as hot as the tap gets) water over them and let them rehydrate. This super hot water can be a culprit for both bitterness and toughness. When the mushrooms get shocked with the hot water, it partially cooks them and creates an inconsistent texture from the outside to the inside. This causes that chewy, tough texture. It only takes thirty minutes to an hour to soak dried mushrooms depending on how strong you want the soaking liquid to be. The best way (in my opinion) to rehydrate dried mushrooms is to use room temperature water for a longer period of time. This allows for the mushrooms to slowly pull in the liquid at a more natural pace, and it still creates a very flavorful broth. The method below is the best way to rehydrate dried mushroom. Choose. You are not limited to rehydrating only one type of mushroom at a time, so choose the assortment of mushrooms that will best suit what you are making. An assortment will give you a better overall flavor. Cut and Measure. Thin slices of mushrooms will reconstitute better than whole dried caps, so cut your mushrooms ahead of soaking. This also makes it WAY easier to measure. If you’re measuring by volume, I recommend 2 cups of water to every 1/4 cup of dried mushrooms. If you’re measuring by weight, I recommend 2 cups of water to every 0.2 ounces of dried mushrooms..
Soak and Rub. Place the dehydrated mushrooms into a glass container and add the water. Most of the mushrooms will rise to the top. As they do, gently massage them a little. This helps release some of the trapped grit. Let the mushrooms soak for 30 minutes to eight hours depending on how you plan to use the broth. Strain and Rinse. Strain the broth into a second container. Rinse the mushrooms under slow running water to remove the grit. There are two camps when it comes to rinsing rehydrated mushrooms, and I’m on the pro side. Some people feel that this washes away some of the flavor (no bigs if you’re using the broth), but a small decrease in flavor is worth the velvety texture and not biting into sand. Strain Again. Strain the broth a second time through a mesh sieve lined with cheesecloth, paper towels or coffee filters to catch any remaining bits of sand, grit, and grime. One Pan Chicken Orzo with Wild Mushrooms.